A large cache of emails released this month show that the Bill and Melinda Gates Foundation is stepping up its efforts to promote the deployment of a controversial new genetic engineering tool known as “gene drive” to help eradicate malaria in Africa. However, some of the scientists who had initially proposed using the technology for public health and conservation purposes are having serious second thoughts about deploying it outside of labs. Photo by Rick Scavetta, U.S. Army Africa Public Affairs / Flickr A baby receives a trial malaria vaccination in Kisumu, Kenya in 2010. Malaria killed an estimated 438,000 worldwide in 2015. 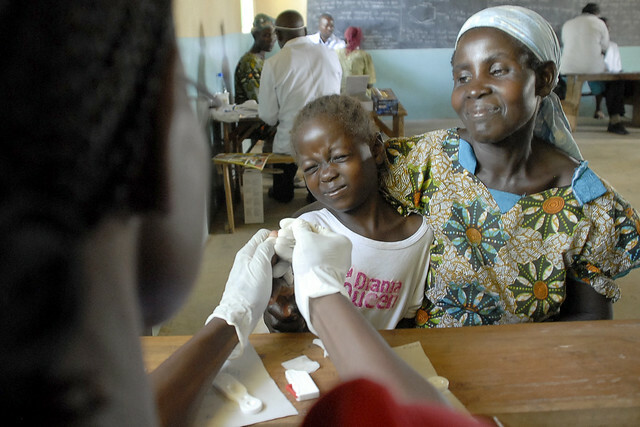 Sub-Saharan Africa continues to carry a disproportionately high share of the global malaria burden. In a effort to combat the disease, researchers funded by the Bill and Melinda Gates Foundation are planning a field trial of gene drive equipped Anopheles gambiae mosquitoes – the main malaria vector in Africa – in Burkina Faso. Gene drives can help circumvent traditional rules of genetic inheritance and force a desired, specifically selected, genetic trait through a population. Given the almost magical possibilities it offers to enhance beneficial traits or remove undesired characteristics in living things – think eradicating pests without using toxins, or saving an endangered species by making them immune to certain diseases – the technology has captured the imagination of many in the fields of conservation and public health. The Bill and Melinda Gates Foundation, which considers gene drives “necessary” to end malaria, has invested some $70 million on Target Malaria, a research organization based at Imperial College in London that is working on preventing deaths from malaria, which numbered 438,000 worldwide in 2015. Target Malaria is planning to release genetically modified Anopheles gambiae mosquitoes – the main malaria vector in Africa – in Burkina Faso. These modified mosquitoes would be equipped with gene drives that would disrupt the reproductive systems of successive generations and eventually cause them to go extinct. The project would be the first field trial of gene drive technology. The emails – which were released in response to freedom of information requests submitted by Edward Hammond, a biosafety activist from Austin, Texas –also show that the environmental advocacy group Island Conservation is developing plans to use gene drives as a mechanism for exterminating invasive species on the islands of Hawaii, New Zealand, and Australia. Gene drive is a revolutionary new genetic technology that could help eradicate diseases and save species. But is it risk-free? The prospect of eradicating pests and disease vectors without using toxins, or saving an endangered species by making them immune to certain diseases, has captured the imagination of many in the fields of conservation and public health. Hammond made the emails public just two weeks after one of the key proponents of the gene drive technology, Kevin Esvelt, published a report saying the technology was too risky to be used in field trials to control invasive species. Esvelt, a professor at MIT who first identified the potential for gene drives to alter wild populations of organisms in 2013, is now warning, once unleashed, gene drives will prove difficult if not impossible to control. Esvelt said that projects that are planning to conduct gene drive experiments to control invasive species in the wild should first invent safer forms of the technology. In a paper published in the non-peer reviewed scientific journal BioRxiv, Esvelt and his colleagues wrote that, once unleashed, gene drives will prove difficult if not impossible to control. The paper, “Current CRISPR gene drive systems are likely to be highly invasive in wild populations,” is currently in pre-publication review. CRISPR refers to Clustered Regularly Interspaced Short Palindromic Repeats, a new technology that allows scientists to alter genes by editing strands of DNA. CRISPR’s invention in 2012 by scientists at the University of California-Berkeley and MIT led to the development of gene drives two years later in Esvelt’s research laboratory. In the BioRxiv paper, the scientists said that mathematical models based on existing empirical data show that in their current form, gene drives cannot be deployed without harmful side effects. Their modeling showed that gene drives can be very aggressive and even a handful of gene drive modified organisms could carry the new gene, not only through much of the targeted population of a certain species, but also on to non-intended populations. For example, under their models, a gene drive released in Hawai’i to kill a specific kind of mosquito on the island of Kauai would eventually start targeting a different kind of mosquito on the island. On the same day his BioRxiv paper was released, Esvelt expressed regret for ever proposing gene drives be used in real word experiments. In an interview with the New York Times , Esvelt called his championing the notion “an embarrassing mistake” given the predicted invasiveness of current CRISPER-based drive systems. But he and his colleagues still thinks researchers should continue exploring ways in which gene drives could help save species that are in peril. The new report confirms concerns that many within the scientific and environmental community have had about the unknown ecological and public health risks posed by a technology whose basic purpose is to spread genetic mutations. Nevertheless, the GBiRD emails show that that the Gates Foundation is ploughing ahead with its research on gene drives as a mechanism for eradicating the mosquito that causes malaria (which, it should be noted again, is not an effort to control an invasive species, but rather an effort to eradicate a disease-carrying insect). In 2016, it made a $1.6 million payment to Emerging Ag, a PR firm it retained for the purpose of influencing a United Nations expert group that has been addressing gene drive issues. The group, the Ad Hoc Technical Expert Group on Synthetic Biology (AHTEG), was convened by the UN’s Convention on Biological Diversity. Hammond, who posted the emails to his website, is a former member of AHTEG. One of EmergingAg’s initiatives has been to recruit scientists who will advocate for gene drives. For example, in an Aug. 1, 2017 email thread, Isabelle Coche, a vice president of EmergingAg, is trying to recruit Fred Gould, codirector of the Genetic Engineering and Society Center at North Carolina State, for advocacy work. The email asks Gould to “support advocacy and engagement activities on gene drive.” Gould, however, demurs, saying, “it would be problematic for me to be involved,” adding that such advocacy would “compromise” his role on a gene drive ethics committee. Coche’s role at EmergingAg, according to another email, is “to fight back against gene drive moratorium proponents before the next CBD meeting in 2018.” This was in reference to calls from several anti-gene drive groups for an international moratorium on gene drive research in petitions last year before the United Nations Convention on Biological Diversity (CBD). The CBD rejected those petitions, which are likely to be repeated at next year’s CBD meeting. On its website, Emerging Ag calls itself “a boutique international consulting firm providing communications and public affairs services.” Its president and founder is Robynne Anderson, a former international communications director of CropLife, the global lobby group for the biotechnology, seed, and pesticide industries based in Brussels, Belgium. On her personal website, Anderson praises gene drives without actually mentioning the biotechnology by name. Island Conservation, meanwhile, sees gene drives as a tool that can rid islands of invasive pests without the use of chemical pesticides. The group says that 180,000 islands around the world are infested with alien rodents, but only 400 rodent eradication programs to date have been successful, and each relied on rodenticides to remove the non-native populations. *UPDATE, December 22: To be clear, this risk is not of gene drives spreading to other species. The risk is that they could spread to other populations, or rather, sub-species of the same species — for example to any of the other 205 mosquito species in the Anopheles subgenus — and as a result impact local ecosystems where they might serve key roles, such as, as a food source for other critters. This report isn’t implying that gene drives can jump the species barrier spread to other species. This article has also been updated to clarify that Esvelt has cautioned against use of gene drives, in their current form, to control invasive species.